The International Neuroethics Society (INS) is pleased to announce a call for submissions for the 2019 Neuroethics Essay Contest. Now in its sixth year, the contest aims to promote interest in neuroethics among students and postdocs from around the world. One winner from each category will be selected in August and recognized at the 2019 INS Annual Meeting in Chicago—the premier gathering of professionals dedicated to neuroethics. Winners will receive a free 1-year INS student membership and if able to attend the annual meeting will receive a travel stipend ($250 USD) to support travel to Chicago. Share this call with your colleagues and students! Direct them to this page or distribute our contest flyer with key details and deadlines. In addition, up to five authors who submit an essay for a general audience category will be selected to participate in an optional 1-on-1 editorial mentorship with science communication consultant Elaine Snell and science journalist Mo Costandi, co-chairs of the INS Communication, Outreach, and Membership Committee. The winning essays and those selected for the mentoring opportunity will be considered for publication by the INS or another institution appropriate for the topic discussed. Essays must be submitted by July 12. Incomplete or late submissions will not be accepted. Please review all eligibility and submission requirements below. The INS, in collaboration with the International Youth Neuroscience Association (IYNA), is pleased to announce that the Neurothics Essay Contest is now open to high school students! This new category aims to promote interest in neuroethics among secondary school students around the world. Winning essays in the High School category will be jointly published on the INS website and featured in the IYNA Journal, website, and newsletter. Please review all eligibility and submission requirements below. All high school students (enrolled in the 2018-2020 academic year) and post-secondary students (enrolled in a degree-granting program at the undergraduate, graduate, or professional level during the 2018-2020 academic years) are eligible to participate. Postdocs, residents and other early-career trainees are eligible. The committee encourages essay submissions from authors training in fields such as neuroscience, law, medicine, philosophy, and many other social and natural sciences. There are no restrictions regarding an author’s area of study as long as their essay meets all requirements outlined below. Authors from all countries and regions are encouraged to participate. Authors do not need to be members of the INS to submit an essay. Participation in the contest does not preclude future submission of an extended version of the manuscript to academic journals. Any questions about eligibility should be directed to the committee by email ([email protected]). Essay submissions can cover any topic in neuroethics and should address a focused problem at the intersections of the mind and brain sciences, ethics, and law. Example topics include, but are not limited to: neuroenhancement, brain stimulation, ethics of neurodegenerative illness, philosophy of mind, clinical ethics in psychiatry and neurosurgery, neural imaging, big data and neuroscience, brain–computer interaction, military applications of neurotechnology, and free will. The committee makes no restrictions regarding neuroethical topics and encourages authors to take creative approaches with their essays. Academic essay submissions should critically explore a current issue in neuroethics through a rigorous, evidence-based argumentation. Essays should be succinct, polished final drafts that are suitable for publication in a neuroethics, bioethics, or medical ethics journal. Essays must be written in English by a single author and may not exceed 2,000 words, excluding references and disclosures. Students must submit original, unpublished work. Essays produced for or derived from previous coursework are eligible for submission. Science communication essay submissions should explore the interface between ethics, neuroscience and society in plain language for the general public. Essays addressing neuroethical topics of high social significance are particularly welcome. Essays must be written in English by a single author and may not exceed 1,000 words, excluding references and disclosures. Five authors submitting a science communication essay will be selected to participate in a 1-on-1 editorial mentorship with a professional science writer. Authors selected are expected to participate in the mentorship opportunity. This new essay category is specifically for authors currently enrolled in high school. Essays should explore the relationship between ethics, neuroscience and society in plain language for the general public. Essays should be based on reliable primary and secondary sources (Wikipedia and similar sources are not acceptable). Essays must be written in English by a single author and may not exceed 1,000 words, excluding references. While not part of the essay contest, the INS accept scientific abstracts for the annual meeting. The call for abstracts will be released in a few weeks. Submissions for the Academic Essay and Essay for a General Audience categories must be saved as a single file (pdf, doc or docx) and emailed to [email protected] with the subject line “Neuroethics Essay Contest." Entries for the High School category should be submitted to the IYNA Journal. Please note in the author comments that the essay is intended for the “Neuroethics Essay Contest." Files must include a cover page containing the author’s name, selected essay format, email address, phone number, program affiliation, type of degree, and year of study. The essay’s title and text should start on page 2 and not contain any of the author’s identifying information to allow for blinding essay for review. Submissions must be received by July 9, 2019, at 11:30 p.m. EDT. Incomplete or late submissions will not be accepted. 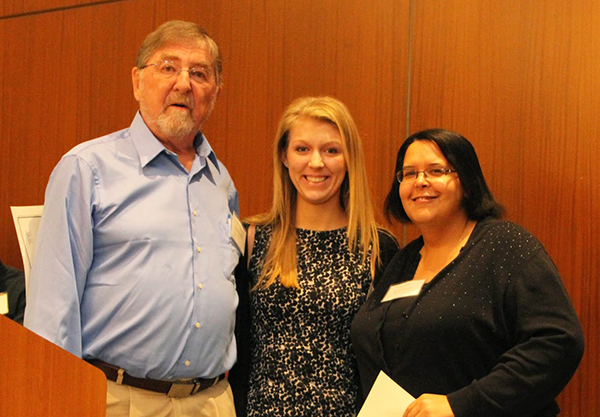 The 2016 INS Student/Postdoc Essay Contest winners Kaitlyn McGlothlen and Monique Wonderly, center and right, received an award and stipend, presented by Dr. Michael Patterson, left. Essays will be judged on their originality and structure of argument, conceptual clarity, rigor of defense, quality of writing, and conclusions. Submissions undergo a blind review by two or more referees from the INS Student/Postdoc Committee, as well as judges from the IYNA for the High School Essay submissions. The INS committee includes a faculty mentor and is comprised of university students and postdocs from the fields of neuroscience, law, medicine, philosophy, and other areas of the sciences and humanities. All decisions made by the committee are final. Notification of the contest winners—one from each essay category: Academic, General Audience, and High School—will be emailed to all submitting authors by August 15 and will be announced in the INS newsletter. The committee will also select and announce up to four authors who submitted essays for a general audience, in addition to the winning author, to participate in the mentorship opportunity. The winning essays from the Academic and General Audience categories, as well as the authors offered the mentoring opportunity, will be considered for publication on the INS or another institution appropriate for the topic discussed. All High School Essay submissions to the contest through the IYNA Journal will be considered for publication in the journal's neuroethics column. Participation in the contest does not preclude future submission of an extended version of the manuscript to academic journals. The contest has attracted submissions from young researchers around the globe and has recognized two authors of outstanding scholarship each year since 2014. A list of past winners and their essays are available to reference as you put together your contest submission. The International Neuroethics Society is an interdisciplinary group of scholars, scientists, clinicians, and other professionals dedicated to encouraging and inspiring research and dialogue on the responsible use of advances in brain science. People at all stages of their career join the Society to interact, learn, and participate in critical neuroethics discussions that further this growing field.